This is a critical guide to the Ontario Algonquin Land Claim, originally published in the Leveller in early 2016. Click on the image for a version you can zoom in on. 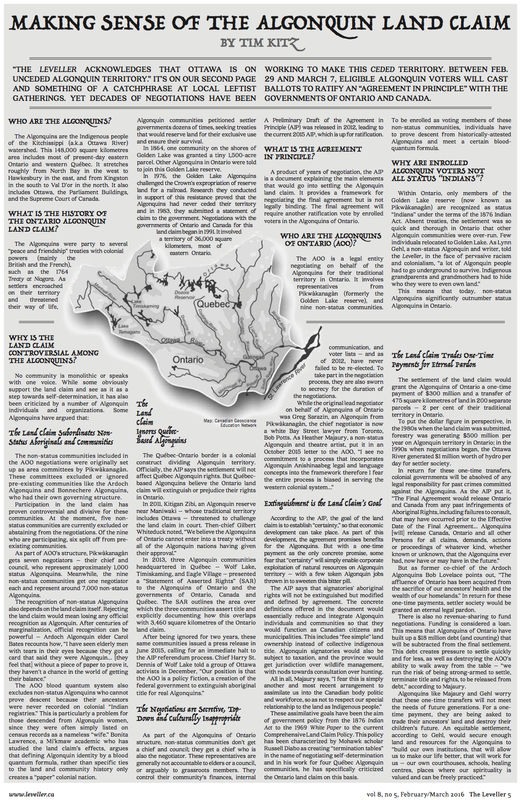 The article relied on Bonita Lawrence‘s book Fractured Homeland: Federal Recognition and Algonquin Identity in Ontario (reviewed here), interviews with Lynn Gehl and Heather Marjaury, several news stories on the land claim, Russ Diabo’s analysis of the Comprehensive Land Claim Policy, and a close reading of the Agreement-in-Principle. Lynn Gehl has also written extensively on the Land Claim, both on-line and in print. Please take the time to read and support these indigenous voices.